I board the plane from NY via Doha to Bombay, to Manbai, Mambe, Mundadevi, Bambai, Mumbai… to the Bon Bahia of the seven islands of Heptanesia, from the beginning not one but several. This is the world's densest city. Describable only by a multitude of substitutes, names, references, mythologies and movements. 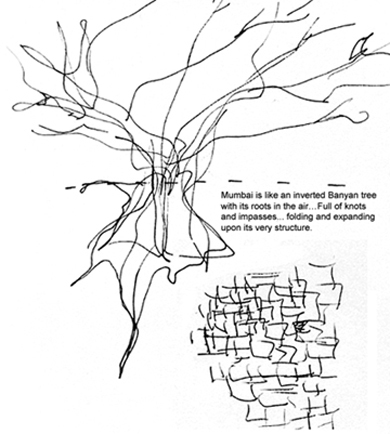 Mumbai is like an inverted Banyan tree with its roots in the air… full of knots and impasses. A double growth encroaching land and sky, folding and expanding upon its very structure. It collects living organisms, stories, dreams, money, dust, and more. It feeds from them. Everything that comes into it becomes entangled, digested, differed, transformed. During the day, I am in Mumbai, but not there. Between the city and me: a window, a large concrete wall enclosing the hotel several meters high,guards, and a vast empty field. Too see a clearing in Mumbai is a strange phenomenon. Beyond this solitude: density and towers rising ina vaporous blur. Silence. In the background I heard a multitude of voices and dialects echoing thought in the dilapidated concete hall of the airport. Night will be the only time I have to move through the city. My window becomes a screen where external movements become abstract patterns resembling folds and mosaics: a cubist landscape of fragments, towers sprouting from village like enclaves, and slums on the edges of marshes and train tracks unfolds. The difference of scales is most striking. Mumbai appears to be composed of a multitude of villages and cities massed so close together they become weaved patterns through a contiguous landscape of growth and density. Mumbai is full of trees and flowers; next to the roads and slums one finds numerous plants and animals. Lining avenues, streets and small roads: black plum jumun, mango trees, jackfruit, rain trees, palms, jungle badan, copper pods, crepe myrtles, gulmohar, multi-colored bougainvillea, Rangoon creeper, white Indian champas and the great Banyan. At night, spirits crowd around nooks and crevices on the brightly illuminated Banyan. The im-possibility of place and displacement becomes critical in Mumbai. Migrant flows from around the country and abroad are reloated in dense nodes throughout the city. These flows are part of a broader network of movements, displacements and transmissions and move through culture, gender, relgion, langugages and urban relations. Mumbai is like a rhizomatic maze going back before the Portuguese, before the British; before the fishermen into the rhizomatic growth of mangroves and underground carvings of Buddhist and Hindu caves. Mumbai is like a Banyan, considered sacred and eternal because of its seemingly unending expansion. Mumbai finds a place for all and none. Mumbai breaks the figure of a type: the hut, the house, the tower, the railway, the street, the tree, the marsh, the mangrove, the bridge, the sidewalk, and other surfaces and structures become places for habitation. Night will be the only time I have to experience the city. To experience Mumbai by night, to survive the day through the exhaustion of an air-conditioned enclosure and go out into the dense night air is extreme. To survive the day through the exhaustion of an air-conditioned enclosure and go out into the dense night air is extreme. Mumbai is the insomniac's dream and nightmare. A hazy vision and multitude of lights and colors, landmarks, glossy glass buildings, concrete towers, decrepit colonial buildings, gothic spires, the steeples, temples, mosques, churches, neon signs, old fiats and marutis wreaking havoc on the streets with their suffocating exhaust and slow pace among people, bicycles, street vendors, flowers, mirrors, children and gods. Exhaust and exhaustion are interchangeable terms on the streets of Mumbai. Mumbai is an urbanist dream and nightmare. One finds all and nothing, between chaos and structure. How to describe the different points of view from Malabar Hill to Dharavi? To compare a departure from New York City with an average population of 157.81/sq km to the arrival into Mumbai with varying populations of 23,900/sq km to 314,887/sq km is to run through a vast gap of urbanism in seconds. But to cross Mumbai from one place to another is to cross a wider topography of urban differences. Malabar Hill can be compared to NY, but not to Koliwada. Suketu Mehta describes it clearly: “The city of Bombay is divided between the air-conditioned and the non-air conditioned.5”. Between the formal and informal: a difference of degrees. What is the (non-)place of the informal? What is a structure without infrastructure? Hiw di flows and exchanges between the formal and informal transform and create new urban types and conditions? Mumbai has a multitude of arteries and nodes of commerce; it is not hierarchical but distributed and disseminated between top international firms and slum initiatives. This is a wide flow, a diagonal flow, one that crosses from one sphere to the next by analogous contingencies. In its movements and transformations of over-urbanization and extremes, Mumbai exposes its mechanisms of survival: is in its porosity and fluidity that Mumbai is able to engage and communicate through its people. Mumbai is an open city of commerce and transference. A collective urban drive acts like a magnet and calls for more exposure, more transactions, more discussions, more people, more cars, more houses, more shops, more money, more poverty. To describe the arrival into the night of Mumbai one would have to run through the endless brilliance of faces, jewelry, fabrics, textures, images of Shah Rukh Khan, garland Ganeshes, crowds and smells muted by the dimness of fog and smog which suffocated the day's traffic. At 4:00 am, I pass the airport entrance barricaded with sandbags and the khaki-riffled police looking very anxious. To travel down a road with no traffic is an exhilarating experience. To be able to move through this city without obstructions: an excess. 1. Mehta, Suketu. Maximum City, Bombay Lost and Found. Penguin Books, 2004. 2. Duras, Margarite. India Song. Editions Gallimand, Paris. 1973. Aida Miron is an architect and urbanist. She is currently living between Brooklyn and the Redlands in South Florida.